Finally… the US industrial economy has some good news. Goods demand has stabilized and inventory drawdowns are over. 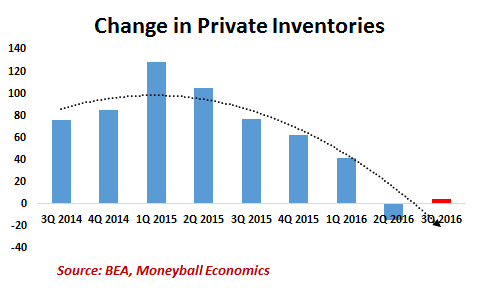 As the chart of inventory shows, starting in the second half of 2015, companies began cutting down on stockpiles. This matters because companies don’t hire or spend when their end-users are saying they have enough stock on hand. The US industrial economy has been in a holding pattern of sorts as they bled off the inventory overhang (too much supply for existing demand). The order of the day has been to make less: factory production was cut – Factory Capacity Utilization has fallen to 2014 levels – along with payrolls. Once the equilibrium shifts away from excess supply, business investment will start to tilt up. It already has begun tentative steps in that direction: 3Q inventories grew again. Looking forward into 2017, producers foresee organic demand growth and continued inventory discipline, and the combination should boost prices and margins. However, expectations need to be tamed. The direction is clear (up), but the degree at which it’s climbing is still in question. One concern is that the recent growth (3Q GDP hit 3.5%) may be a bit transitory. Heading into the first half of 2017, momentum could slow down. Again, this is an inventory story. The first half of 2016 saw inventory cuts whereas the 2H has seen inventory rebuilding. But that restocking is winding down. Another concern has to do with the US consumer. Central to the business strategy is holding back payroll and capital expenditure (CapEx) spending. The formula is straightforward: as capital goods demand pulled back closer to 2014 levels, so did staffing and CapEx. Demand has to grow quite a lot for companies to start expanding. 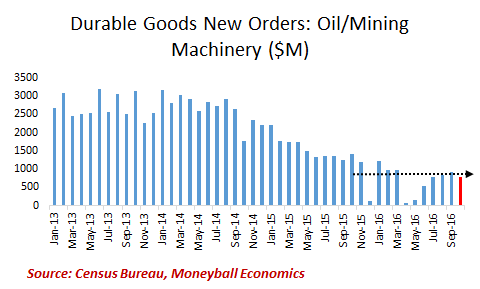 “A major reason for the stabilization is that oil & mining equipment orders (30% of the contraction) have stopped falling. They have fallen 80% to barely $250 million per month. They really can’t fall any more. 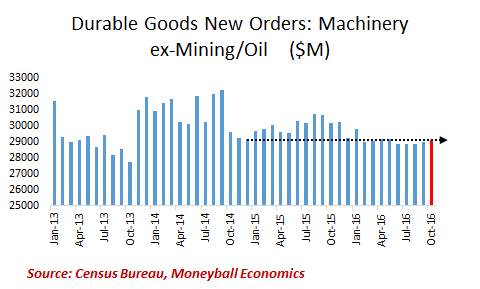 Oil and mining equipment orders have resumed. All other machinery orders have simply stopped contracting. 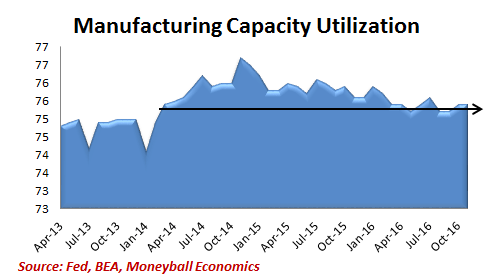 As you’ll see in the chart below, US manufacturing capacity utilization may have stopped contracting and bottomed at 2014 levels. 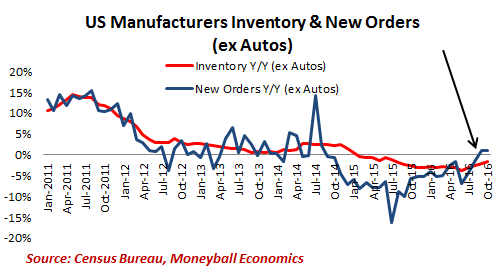 And despite the acceleration in new orders, inventories continue to contract. Companies need sustaining demand before they begin expanding their inventories again. Keep your eye on the Chinese New Year. The Lunar New Year starts January 28th. A lot of production activity will get pulled in advance of the long vacation. That means a December and early January activity boost. Investors looking for good news will misread the burst of activity and consider it part of a continuing trend of growth. For example, the China and global PMIs will jump. KEY TAKEAWAY: Thankfully, things have stabilized in the US for now. Momentum is still sluggish, and we can easily see a major contraction coming down the pipes. But for now, things have stabilized with a slight uptick in certain industrial categories.